Have you ever wanted to host your own live radio show? Well now you can do it straight from your TypePad blog. Using NowLive’s Talk Show widget you can begin broadcasting a live call-in show from a TypePad post or page in less than 60 seconds. What is really cool about this widget is that it will let you take live phone callers, post pictures and videos and text chat with your audience. You can host a show from a regular telephone or on a PC headset. It is super easy and requires no downloads. The broadcast even saves as an iTunes podcast for audience members that can’t listen to your live show. Update: We forgot to mention that the Art Nouveau Red theme was inspired by a banner created for a design contest held by our sister product Vox. The designer, MiniPez, shares his inspiration for the design in this Team Vox post. Has your blog’s design been feeling a bit...penned in? Let it roam free with these two new nature-inspired themes. Both themes feature a fresh, clean layout. The Art Nouveau Red theme adds energy with a stylized butterfly, while the Zen theme (which comes in four colour schemes) gives a more relaxed look with a simple silhouette design. You can choose either of these themes by selecting the “Change Theme” option on the Design tab. CNET’s Crave blog has a great review of the TypePad mobile app, with some good tips about how to get the most out of it. 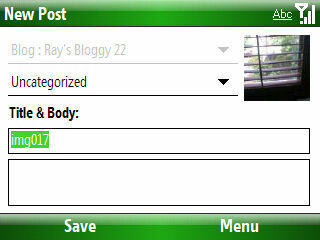 TypePad Mobile lets you post to your TypePad blog from your Symbian, Palm or Windows mobile phone. Have a supported device, but don’t have TypePad mobile yet? Learn how to install and use the TypePad mobile app in this Knowledge Base article. TypePad was unavailable between approximately 2pm and 8:00pm PDT on Tuesday, July 24, 2007. We want to apologize for any inconvenience or frustration this caused. Around 2pm PDT there was a power outage in the SOMA neighborhood of San Francisco which affected over 30,000 people in the San Francisco area, as well Six Apart's co-location facilities. This power outage caused downtime in several large networks, including all of Six Apart's services (TypePad, LiveJournal, Vox and TypeKey) and other networks such as Craigslist, Technorati and Yelp. Once power was restored, Six Apart staff began an ordered process of restoring data to each of our sites. This process lasted over a span of several hours, as there is a step-by-step process to bring machines back up and make sure the network is running. During the downtime we were able to send a brief email to TypePad customers who are signed up for email notifications. Once the Six Apart website was back up, we posted updated information there. We are working with our co-location facility to understand the failure of their backup power and to ensure this does not happen again. We're adding a backup status alert system to notify you in case the primary service is down. Again, we apologize for the inconvenience caused by the window of time where you could not access TypePad. Thank you for your patience and support. TypePad members with appropriate opt-in settings should have received an email from us this afternoon about the outage. We will send another email to members when the service has been fully restored. We will also be posting more details about today's outage to Everything TypePad. We are truly sorry for the frustration and inconvenience that you've experienced, and will provide as much additional information as possible as soon as we have it. We also appreciate the commiseration from the teams at many of the other sites that were affected, such as Craigslist, Technorati, Yelp, hi5 and several others. If you're writing your blog for a specific audience -- technology enthusiasts, healthcare professionals, designers, etc. -- a great way to help make money from your blog and provide a service for your readers is running your own job board. Our friends at Simply Hired recently introduced Job-A-Matic, which lets you build your own job board, sell job listings on your site, and make money along the way. What we love about Job-A-Matic is just how easy they've made it to integrate a job board with a TypePad blog. When you create a new Job-A-Matic job board, you can customize it to look like your TypePad blog by importing your TypePad theme. You can promote your job board on your blog through the Job-A-Matic Widget. And don't worry about having an empty board; when you create your job board you can choose to syndicate in job listings from the Simply Hired network. And when someone posts a job on your board, that listing is shared across the Simply Hired network and out on to sites like LinkedIn and MySpace, giving your listings more visibility. Job-A-Matic runs their blog on TypePad, and it's a great place to learn more about how to get started with a job board, and how to make the most of their service. Twitter + TypePad Widget = Twidget? The TypePad team’s all a twitter (sorry, that was just too easy) about the new Twitter widget that displays your latest tweets on your TypePad blog, and makes it easy for your readers to follow you on Twitter. It even auto-magically formats itself to match your blog’s theme! You can get the widget here. For the latest news from TypePad and the rest of the Six Apart team, follow the Six Apart Twitter stream. What do the TV program This Old House, David Sedaris, the Boston Red Sox, and the historic preservation of Boston have in common? They are just some of the topics covered by passionate and prolific TypePad bloggers in the Boston area. Interior designer Abbey Koplovitz presents design tips for the rest of us in her blog, On Interior Design, sharing beautiful photos that illustrate her design challenges and accomplishments. One of her recent renovation projects will be featured this fall in the TV program This Old House, whose editors and producers keep three different TypePad blogs for the show and magazine: Old House My House, The Shelter Life, and The Hardware Aisle. Aisle Be Seeing You is a blogospheric guide to the Boston Celebrity Series, a music, dance and art performance series presenting a wide range of performers who will visit Boston this season, including Itzhak Perlman, The Paul Taylor Dance Troupe, and David Sedaris. The blog gives great links to resources about each performer. And how ‘bout those Red Sox? Three popular TypePad blogs discuss, dissect, analyze, and laugh at the adventures of the Sox, covering everything from the shape of Josh Beckett’s facial hair in the humorous blog Cursed To First, to Derek Hixon’s analysis of the team’s performance in the Sawx Blog, to commentary on the relative merits of the Sox vs. the Yankees on the active Yanks Fan Sox Fan blog. All three of these blogs are entertaining and engaging, as you can see by the many comments of their readers. For a walk down memory lane, visit the City Record and Boston News-Letter, where you will find rich information about the history of Boston and its environs. Historian Charles Swift shares old Boston maps, recommends good summer reads, and answers readers’ questions about all things Boston history.